Concepted by the same team behind Gin Khao at East Coast Parkway, Som Tam pride itself in ‘giving Thai food a new leash of life’. 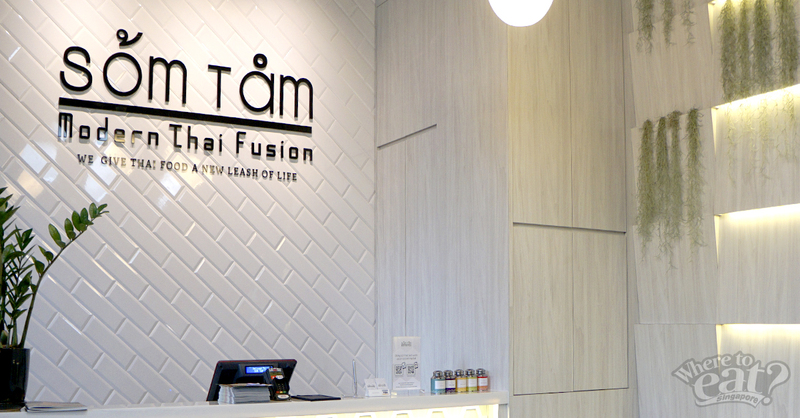 Basically Som Tam is a modern fusion restaurant and has a menu made up of Thai-meets-somewhere-else cuisine. Sitting quietly in a corner of level 8 at Orchard Central, the restaurant’s interior is bright and light, completed with white-washed walls and minimalist furniture. Despite the funky names on the menu, Som Tam would be an appropriate choice of place for a no-brainer dinner with your bunch of friends or family. As though to remind us of the unforgiving heat that Thai food delivers, Som Tam’s Coconut Mojito helps keep the flames in check at the right moment. Also, Perrier with Honey Thai Lime works well as a palate cleanser packed with sweet and sour flavors. The impressive one of the lot has got to be Iced Thai Matcha Yen, a masterful welding of jasmine tea and matcha with a deceiving outlook of the texture, but is in fact surprisingly refreshing. The name behind the restaurant, Som Tam is full of crisp vegetables and fruits mixed with intense condiments. 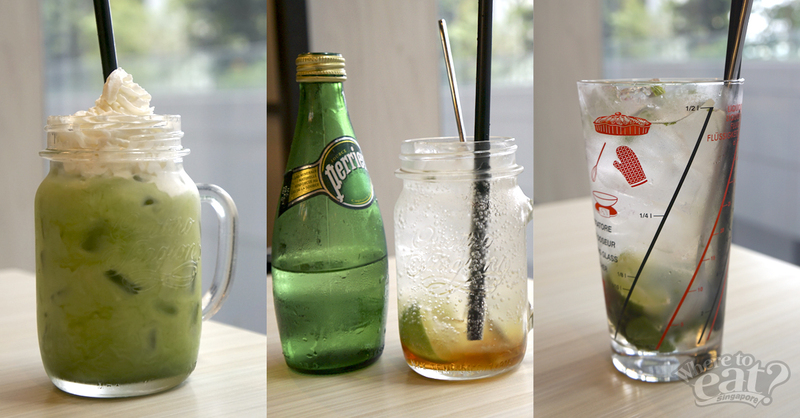 Served in a mason jar, diners will need to mix it up by shaking the jar. 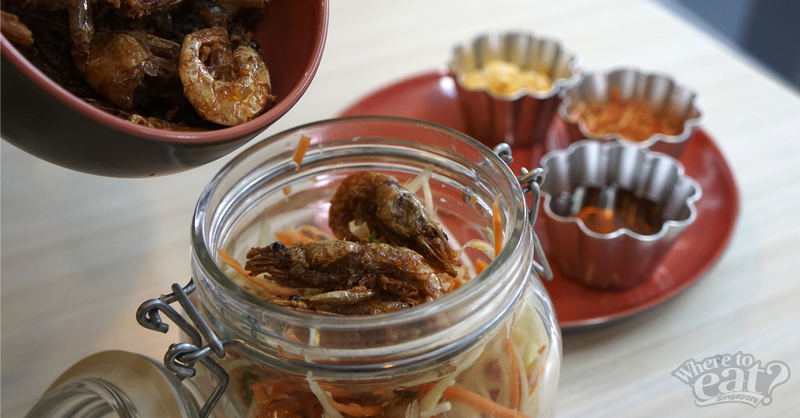 Turn up the excitement by adding toppings such as Gai Kem (Salted egg), Dried Shrimps, Thai Chicken Sausage Deep Fried Sweet Prawns, or Prawns. 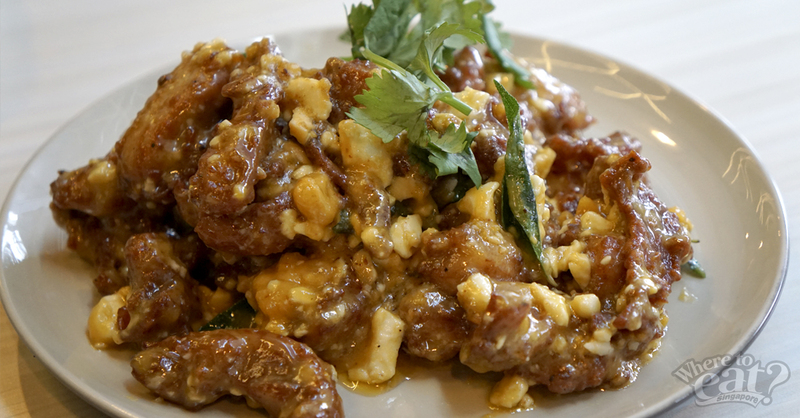 For relief of the incendiary Som Tam, try the Deep Fried Chicken with Creamy Salted Egg. This is a reinvention of Korean deep fried chicken, although the salted egg reminded us of chinese zi car. A small amount of Basil is wilted like a leafy green together with the salted egg gravy, then topped with coriander for a Thai flavor. Your sense of taste would probably be obliterated by the aggressive flavours of tom yum powder-spiked truffle fries, though it works as the perfect nosh for a break from your clean-eating habits. Shrimp paste are incorporated into the patties in the nuanced fusion dish Kapi Beef Burger, if you taste hard enough, you might accidentally taste a subtle hint of shrimp paste. 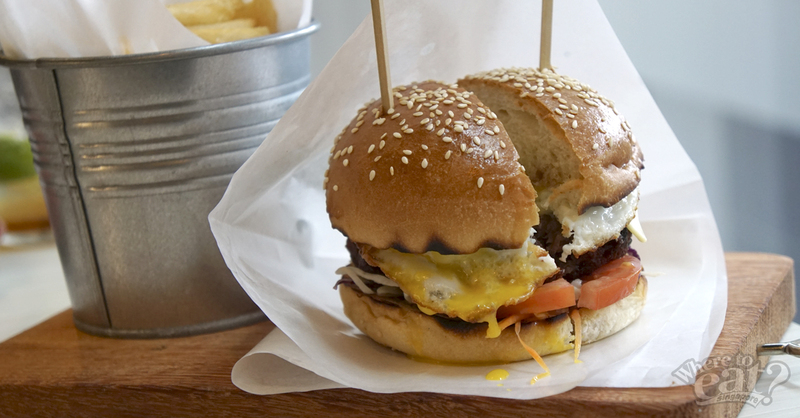 The burger follows the style of any other you find in burger joints – topped with egg, cheddar cheese and chef’s special sauce. 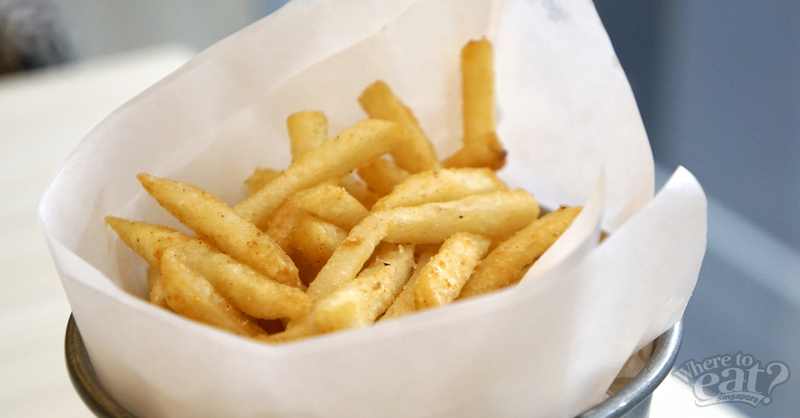 Every serving of it comes with a side of fries, so order this for a lunch to grab when you’re rushing for time. 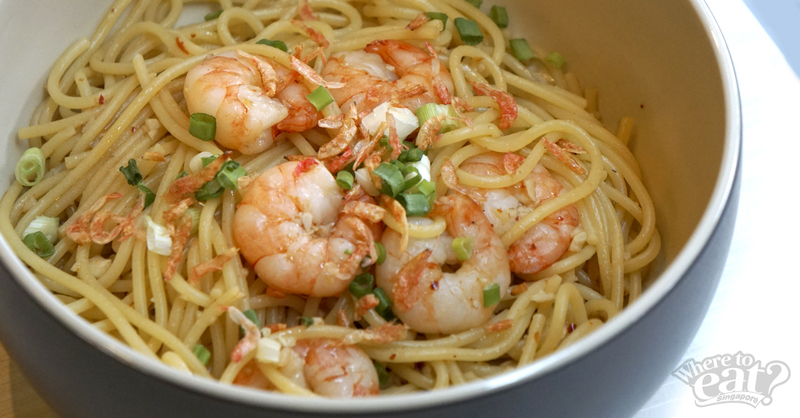 Aglio Olio Style Tom Yum Prawn Pasta is the definition of fusion, despite its lack of taste in tom yum. Even so, the al dente noodles, which are sauteed together with a salty and assertive pasta sauce, are definitely up to standard. 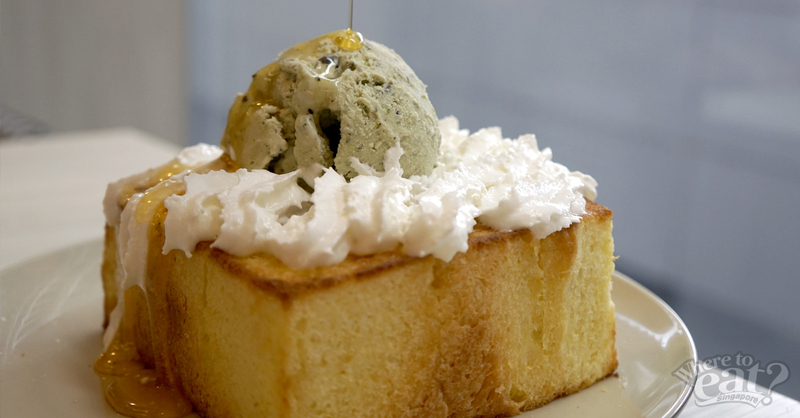 After You Toast is a pretty straightforward dessert – buttery toast topped with palm sugar syrup, whipped cream and gelato (choice of Green Curry, Thai Tea, Sticky Rice, or Thai Basil with Choco Chip). Thai Basil with Choco Chip is highly recommended, which is a great match to the rich buttery flavors of the toast.